It's increasingly unusual that a thriller can claim to maintain its intensity for the entirety of its running length. No Escape is masterful at keeping the stakes high without confounding our so-called "suspension of disbelief." Unlike movies grounded in the surety that the protagonists are going to get to the finish line unscathed, No Escape creates a modicum of uncertainty. Some of what happens is disturbing. This isn't lightweight, fanciful entertainment; it's tense, white-knuckle material. No Escape establishes its scenario using the "stranger in a strange land" premise. Unassuming engineer Jack Dwyer (Owen Wilson) transplants his family - wife Annie (Lake Bell) and young daughters Lucy (Sterling Jerins) and Beeze (Claire Geare) - from the familiarity of Austin, Texas to the incongruity of an unnamed, unstable south Asian nation. What initially looks like a promising new start turns into a nightmare. A coup and the resulting unrest make the environment toxic for foreigners - especially those associated with Jack's new employer, a multinational conglomeration understandably demonized by the rioters. As the situation becomes increasingly dangerous for the Dwyers, with their hotel under siege and the American embassy sacked, a British ex-pat named Hammond (Pierce Brosnan) comes to their aid in an attempt to redeem an uneasy conscience. Although the location isn't named, geographic cues point to Cambodia. The background is familiar from real-world events: the have-nots, fed up with being exploited by an indifferent dictatorship, assassinate the leader and go on a rampage. The situation is terrifying for innocents like the Dwyers, who are hunted for reasons they don't understand and have few allies - even when the locals disagree with the mob, they don't want to become involved for fear of negative repercussions. Jack and Annie are resourceful and courageous but their capabilities are limited. That's one of the things that makes No Escape so suspenseful. These aren't traditional action heroes. They don't carry guns and are ill-prepared for the kill-or-be-killed nature of their situation. Violence is shocking to them. About 90 minutes of the movie's 103-minute running time are devoted to the escape. The setup is economical and, once bad things start happening, they cascade. Jack and Annie are forced to make desperate, life-threatening decisions. One standout scene involves a leap from the top of one building to the roof of another. The gap is perhaps less than ten feet but the way in which this is choreographed by director John Erick Dowdle (Quarantine) is enough to cause heart palpitations. No Escape doesn't offer a lot of downtime. There are scenes of wrenching brutality. The film finds a way to break the tension with some low-key banter between Hammond and his sidekick, "Kenny Rogers" (Sahajak Boonthanakit ), but it never lasts long. Neither Owen Wilson nor Lake Bell would seem like a natural fit for their roles but they turn out to be perfect choices. With Pierce Brosnan filling the expected gun-toting "heroic" part, they are allowed to be ordinary people trapped in extraordinary circumstances, and that's what makes the movie compelling. Brosnan doesn't have a lot of screen time - Hammond is a secondary character but he's not around for many of the most dangerous situations. No Escape would have been a different (and likely inferior) experience had the leads been played by recognized action stars of yesterday or today. Wilson and Bell inhabit their characters and draw us more deeply into the situation than would be the case with more generic, expected portrayals. Perhaps the most controversial aspect of No Escape is the way in which the girls are handled. Putting children in harm's way is an effective way to ratchet up tension but it can also be seen as gratuitously manipulative. Dowdle is careful about how he handles the danger to Lucy and Beeze. The threat to them is real but his camera never lingers in an unseemly manner, nor does the script force them to act in a way that's inappropriate or unlikely for two kids trapped in this situation. Their presence is the catalyst that forces Annie and Jack to take extraordinary chances. Parents may not relate to some of the extreme circumstances but they will understand the emotions underlying Jack and Annie's actions. Too often, thrillers are packaged as safe, sanitary excursions into overblown action and special effects-enhanced stunts. 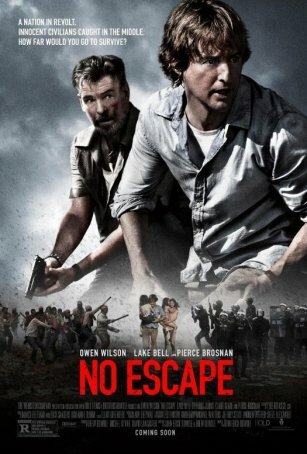 No Escape is a throwback to an era when movies of this genre were defined by suspense and tension. Dowdle isn't interested in providing a safe harbor for those who want a comfortable way to spend two hours. His vision is edgy and exhausting and, for the most part, his execution breathes life into it, tossing a firecracker into the sleepy post-summer movie doldrums.